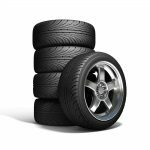 Regardless of how well the tires on one’s current daily driver may be doing at the moment, it is a fact of life that sooner or later, one will need to begin the search for new replacement tires. However, since most people don’t have unlimited amounts of money to throw at car repairs, it is worth shopping around to find good deals. That said, in order to find good deals on tires, one must know where to look, when to look, and what to say when it comes to bargaining and negotiation. Here are some tips on how to find the best deals on tires for one’s next purchase. First of all, start with the information on the sidewalls for one’s current tires, as the replacement tires will need to be a close or exact match in order to perform their best. The information is typically inscribed on the sides of the tires beneath the name of the tire manufacturer. Information included will typically involve the relative width and wall heights of the tires as well as the size of the wheel. This will all be contained in a number that should be written down so one can refer to it in searches over the phone, in person, in the newspaper, and on the Internet. Second, decide on the brand of tire that will be purchased. This is because dealers of particular brands may be able to provide one with significantly better prices on the brands that their stores carry since they obtain these tires directly from the tire factories. On the other hand, when purchasing brands that aren’t naturally carried by the store, one has to deal with markup from the wholesaler, which is passed onto the consumer. Third, it might be worth just heading over to the big box stores to see what prices they have and if one is comfortable paying them. Examples of big box stores include Walmart and Sears as well as membership warehouses such as Sam’s Club and Costco. These stores are likely to have relatively low prices but there will usually not be any room for negotiation; the offered price will be the final price. It is still worth checking, however, as the final price may be a price that one can afford. That said, it is worth doing one’s homework when searching for tires, regardless of whether they are purchased from a smaller shop or from a big box store. It is essential to know exactly what kind of tire one is looking for before walking into the store, as a well informed consumer will not be taken advantage of as easily as a customer who looks like he or she doesn’t know the first thing about tires. Sales people in particular will likely try to sell their highest end tires first because they usually work on commission, and they will have greater commissions for higher priced tires. To that end, it is also important to keep from accepting the first offer that one receives for a tire even if it seems like a decent price. This is because most tires have a significant mark up, and sales people will typically start out by the manufacturer’s suggested retail price and hope the consumer is willing to accept that price at face value instead of negotiating.